For other uses, see William of Orange (disambiguation). William I (Willem Frederik, Prince of Orange-Nassau; 24 August 1772 – 12 December 1843) was a Prince of Orange and the first King of the Netherlands and Grand Duke of Luxembourg. He was the ruler of the Principality of Nassau-Orange-Fulda from 1803 until 1806 and of the Principality of Orange-Nassau in the year 1806 and from 1813 until 1815. 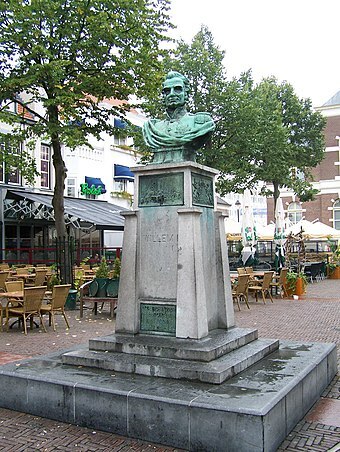 In 1813 he proclaimed himself Sovereign Prince of the United Netherlands. He proclaimed himself King of the Netherlands and Duke of Luxembourg on 16 March 1815. In the same year on 9 June William I became also the Grand Duke of Luxembourg and after 1839 he was furthermore the Duke of Limburg. After his abdication in 1840 he styled himself King William Frederick, Count of Nassau. Nassau-Orange-Fulda was a short-lived principality of the Holy Roman Empire, which was created for the son and heir of the Prince of Orange and Prince of Orange-Nassau and existed only from 1803 to 1806. The Duchy of Limburg was a European polity created in 1839 from parts of the Dutch Province of Limburg as a result of the Treaty of London. Its territory was the part of Limburg that remained Dutch, with the exception of the cities of Maastricht and Venlo. The duchy was a province of the Kingdom of the Netherlands and at the same time was a member of the German Confederation. King William I's parents were the last stadtholder William V, Prince of Orange of the Dutch Republic, and his wife Wilhelmina of Prussia. 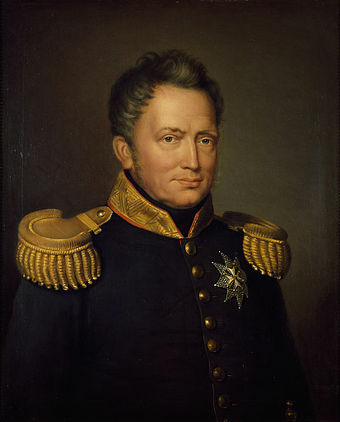 Until 1806, William was formally known as William VI, Prince of Orange-Nassau, [lower-alpha 1] and between 1806 and 1813 also as Prince of Orange. In Berlin on 1 October 1791, William married his first cousin (Frederica Louisa) Wilhelmina of Prussia, born in Potsdam. She was the daughter of King Frederick William II of Prussia. After Wilhelmina died in 1837, William married Countess Henriette d'Oultremont de Wégimont (Maastricht, 28 February 1792 – Schloss Rahe, 26 October 1864), created Countess of Nassau, on 17 February 1841, also in Berlin. 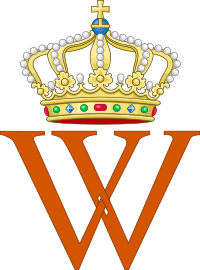 As eldest son of the Prince of Orange (of whom there could only be one at a time) William was informally referred to as Erfprins [lower-alpha 2] (Hereditary Prince) by contemporaries (and later historians) in the period between his majority in 1790 and the death of his father in 1806 to distinguish him from William V.
Frederick, Prince of Orange-Nassau was the youngest son of William V, Prince of Orange and Stadtholder of the Dutch Republic and Princess Wilhelmina of Prussia, sister of King Frederick William II. Commonly called Fritz inside the family, he chose a military career with the Holy Roman Empire, he died of a fever while serving in Padua, Italy. Herman Tollius was a Dutch philologist and historian. The Dutch States Army was the army of the Dutch Republic. It was usually called this, because it was formally the army of the States-General of the Netherlands, the sovereign power of that federal republic. This mercenary army was brought to such a size and state of readiness that it was able to hold its own against the armies of the major European powers of the extended 17th century, Habsburg Spain and the France of Louis XIV, despite the fact that these powers possessed far larger military resources than the Republic. It played a major role in the Eighty Years' War and in the wars of the Grand Alliance with France after 1672. Captain general is a high military rank of general officer grade, and a gubernatorial title. In the same year, 1806, his father, the Prince of Orange died, and William not only inherited the title, but also his father's claims on the inheritance embodied in the Nassau lands. This would become important a few years later, when developments in Germany coincided to make William the Fürst (Prince) of a diverse assembly of Nassau lands that had belonged to other branches of the House of Nassau. Tsar Alexander I of Russia played a central role in the restoration of the Netherlands. Prince William VI (as he was now known), who had been living in exile in Prussia, met with Alexander I in March 1813. Alexander promised to support William and help restore an independent Netherlands with William as king. Russian troops in the Netherlands participated with their Prussian allies in restoring the dynasty. Dynastic considerations of marriage between the royal houses of Great Britain and the Netherlands, assured British approval. The constitution offered William extensive (almost absolute) powers. Ministers were only responsible to him, while a unicameral parliament (the States General) exercised only limited power. He was inaugurated as sovereign prince in the New Church in Amsterdam on 30 March 1814. In August 1814, he was appointed Governor-General of the former Austrian Netherlands and the Prince-Bishopric of Liège (more or less modern-day Belgium) by the Allied Powers who occupied that country, ruling them on behalf of Prussia. He was also made Grand Duke of Luxembourg, having received that territory in return for trading his hereditary German lands to Prussia and the Duke of Nassau. The Great Powers had already agreed via the secret Eight Articles of London to unite the Low Countries into a single kingdom. It was believed that a united country on the North Sea would help keep France in check. With the de facto addition of the Austrian Netherlands and Luxembourg to his realm, William had fulfilled his family's three-century dream of uniting the Low Countries. The States General was divided into two chambers. The Eerste Kamer (First Chamber or Senate or House of Lords) was appointed by the King. The Tweede Kamer (Second Chamber or House of Representatives or House of Commons) was elected by the Provincial States, which were in turn chosen by census suffrage. The 110 seats were divided equally between the North and the South, although the population of the North (2 million) was significantly less than that of the South (3.5 million). The States General's primary function was to approve the King's laws and decrees. The constitution contained many present-day Dutch political institutions; however, their functions and composition have changed greatly over the years. The constitution was accepted in the North, but not in the South. The under-representation of the South was one of the causes of the Belgian Revolution. Referendum turnout was low, in the Southern provinces, but William interpreted all abstentions to be yes votes. He prepared a lavish inauguration for himself in Brussels, where he gave the people copper coins (leading to his first nickname, the Copper King). The spearhead of King William's policies was economic progress. As he founded many trade institutions, his second nickname was the King-Merchant. In 1822, he founded the Algemeene Nederlandsche Maatschappij ter Begunstiging van de Volksvlijt, which would become one of the most important institutions of Belgium after its independence. Industry flourished, especially in the South. In 1817, he also founded three universities in the Southern provinces, such as a new University of Leuven, the University of Ghent and the University of Liège. The Northern provinces, meanwhile, were the centre of trade. This, in combination with the colonies (Dutch East Indies, Surinam, Curaçao and Dependencies, and the Dutch Gold Coast) created great wealth for the Kingdom. However, the money flowed into the hands of Dutch directors. Only a few Belgians managed to profit from the economic growth. Feelings of economic inequity were another cause of the Belgian uprising. William was also determined to create a unified people, even though the north and the south had drifted far apart culturally and economically since the south was reconquered by Spain after the Act of Abjuration of 1581. The North was commercial, Protestant and entirely Dutch-speaking; the south was industrial, Roman Catholic and divided between Dutch and French-speakers. Officially, a separation of church and state existed in the kingdom. However, William himself was a strong supporter of the Reformed Church. This led to resentment among the people in the mostly Catholic south. William had also devised controversial language and school policies. Dutch was imposed as the official language in (the Dutch-speaking region of) Flanders; this angered French-speaking aristocrats and industrial workers. Schools throughout the Kingdom were required to instruct students in the Reformed faith and the Dutch language. Many in the South feared that the King sought to extinguish Catholicism and the French language. In August 1830 Daniel Auber's opera La muette de Portici , about the repression of Neapolitans, was staged in Brussels. Performances of this show seemed to crystallize a sense of nationalism and "Hollandophobia" in Brussels, and spread to the rest of the South. Rioting ensued, chiefly aimed at the kingdom's unpopular justice minister, Cornelis Felix van Maanen, who lived in Brussels. An infuriated William responded by sending troops to repress the riots. However, the riots had spread to other Southern cities. The riots quickly became popular uprisings. An independent state of Belgium emerged out of the 1830 Revolution. The next year, William sent his sons William, the Prince of Orange, [lower-alpha 5] and Prince Frederick to invade the new state. Although initially victorious in this Ten Days' Campaign, the Dutch army was forced to retreat after the threat of French intervention. Some support for the Orange dynasty (chiefly among Flemings) persisted for years but the Dutch never regained control over Belgium. William nevertheless continued the war for eight years. His economic successes became overshadowed by a perceived mismanagement of the war effort. High costs of the war came to burden the Dutch economy, fueling public resentment. In 1839, William was forced to end the war. The United Kingdom of the Netherlands was dissolved by the Treaty of London (1839) and the northern part continued as the Kingdom of the Netherlands. It was not renamed, however, as the "United"-prefix had never been part of its official name, but rather was retrospectively added by historians for descriptive purposes (cf. Weimar Republic). Constitutional changes were initiated in 1840 because the terms which involved the United Kingdom of the Netherlands had to be removed. These constitutional changes also included the introduction of judicial ministerial responsibility. Although the policies remained uncontrolled by parliament, the prerogative was controllable now. The very conservative William could not live with these constitutional changes. This, the disappointment about the loss of Belgium, and William I's intention to marry Henrietta d'Oultremont (paradoxically both "Belgian" and Roman Catholic) made him wish to abdicate. He fulfilled this intent on 7 October 1840 and his eldest son acceded to the throne as king William II. William I died in 1843 in Berlin at the age of 71. Willem Frederik George Lodewijk (b. The Hague, 6 December 1792 – d. Tilburg, 17 March 1849) later King William II of the Netherlands from 1840. Married Russian Grand Duchess Anna Pavlovna. Stillborn son (Hampton Court, Palace, Middlesex, 18 August 1795). Willem Frederik Karel (b. Berlin, 28 February 1797 – d. Wassenaar, 8 September 1881), married on 21 May 1825 his first cousin Louise, daughter of Frederick William III of Prussia . Wilhelmina Frederika Louise Pauline Charlotte (b. Berlin, 1 March 1800 – d. Freienwalde, 22 December 1806). Stillborn son (Berlin, 30 August 1806). Wilhelmina Frederika Louise Charlotte Marianne (b. Berlin, 9 May 1810 – d. Schloss Reinhartshausen bei Erbach, 29 May 1883), married on 14 September 1830 with Prince Albert of Prussia. They divorced in 1849. ↑ The family name changed from "Nassau-Dietz" to "Orange-Nassau" when John William Friso, Prince of Orange claimed the inheritance of Prince William III of Orange in 1702. ↑ The States General were the sovereign power in the defunct Dutch Republic; the troops of the States Army had also sworn loyalty to the States General and not the Stadttholder. ↑ This had become a courtesy title for the Dutch crown prince under the new kingdom. The Batavian Republic was the successor of the Republic of the Seven United Netherlands. 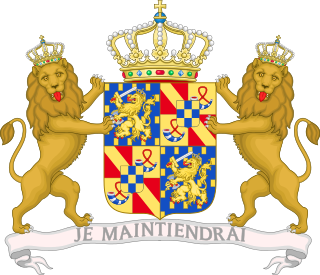 It was proclaimed on 19 January 1795, and ended on 5 June 1806, with the accession of Louis I to the throne of Holland. From October 1801 onward, it was known as the Batavian Commonwealth. Both names refer to the Germanic tribe of the Batavi, representing both the Dutch ancestry and their ancient quest for liberty in their nationalistic lore. Huis ten Bosch is a royal palace in The Hague in the Netherlands. It is one of three official residences of the Dutch Royal Family; the two others are the Noordeinde Palace in The Hague and the Royal Palace in Amsterdam. Princess Wilhelmina of Prussia was the consort of William V of Orange and the de facto leader of the dynastic party and counter-revolution in the Netherlands. She was the daughter of Prince Augustus William of Prussia and Luise of Brunswick-Wolfenbüttel. Wilhelmina was the longest-serving Princess consort of Orange. Gijsbert Karel, Count van Hogendorp was a liberal conservative and liberal Dutch statesman. He was the brother of Dirk van Hogendorp the elder and the father of Dirk van Hogendorp the younger. The Batavian Revolution was a time of political, social and cultural turmoil at the end of the 18th century that marked the end of the Dutch Republic and saw the proclamation of the Batavian Republic. The period of Dutch history that followed the revolution is referred to as the "Batavian-French era" (1795–1813) even though the time spanned was only 20 years, of which three were under French occupation. Jean Victor baron de Constant Rebecque was a Swiss lieutenant-general in Dutch service of French ancestry. 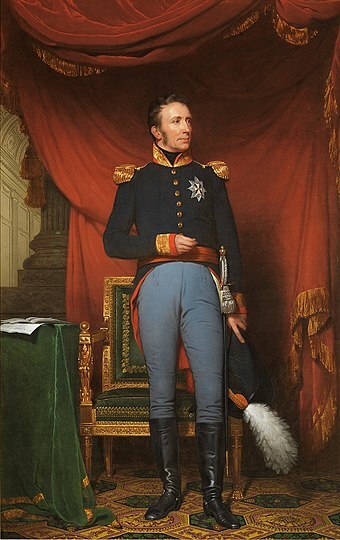 As chief-of-staff of the Netherlands Mobile Army he countermanded the order of the Duke of Wellington to evacuate Dutch troops from Quatre Bras on the eve of the Battle of Quatre Bras, thereby preventing Marshal Michel Ney from occupying that strategic crossroads. The King's Dutch Brigade was a brigade of the British army, organised by the Hereditary Prince of Orange out of former officers and lower ranks of the former Dutch States Army, deserters from the Batavian army, and mutineers from the Batavian fleet that had surrendered to the Royal Navy in the Vlieter Incident during the Anglo-Russian invasion of Holland in 1799, but fully in British service and paid for by the British government. It was commissioned on 21 October 1799 and was initially in garrison on the Isle of Wight and in Lymington. It saw service in Ireland in 1801, and afterwards back to the Isle of Wight and Lymington as well as to the Channel Islands of Jersey and Guernsey. The orders for the brigade to be disbanded were issued on 12 July 1802, as agreed in the Treaty of Amiens of 25 March 1802. 1 2 3 4 5 Bas, François de. Prins Frederik Der Nederlanden en Zijn Tijd, vol. 1. H. A. M. Roelants, 1887. Retrieved 31 March 2013. 1 2 3 4 Schama, Simon (1992). Patriots and Liberators. Revolution in the Netherlands 1780-1813. NewYork: Vintage Books. ISBN 0-679-72949-6. 1 2 3 4 5 Bas, François de. Prins Frederik der Nederlanden en zijn tijd, Volume 2. H. A. M. Roelants, 1891. Retrieved 31 March 2013. ↑ James, W. M. (2002). The Naval History of Great Britain: During the French Revolutionary and Napoleonic Wars. Vol. 2 1797-1799 (reprint ed.). Stackpole books. pp. 309–310. ↑ Genealogie ascendante jusqu'au quatrieme degre inclusivement de tous les Rois et Princes de maisons souveraines de l'Europe actuellement vivans [Genealogy up to the fourth degree inclusive of all the Kings and Princes of sovereign houses of Europe currently living] (in French). Bourdeaux: Frederic Guillaume Birnstiel. 1768. pp. 17, 88. Wikimedia Commons has media related to William I of the Netherlands .